Malta is interfering in Libyan affairs by not recognising Libya’s Salvation Government, recognising instead an official of a government declared null by the country’s Supreme Court on November 6, charge d’affaires Hussin Musrati told the media this morning. The government this evening denied the allegation saying it never interfered and had no intention of interfering. Addressing a news conference at the Libyan embassy, Mr Musrati, who has been in office since November 20, said the Salvation Government was set up on September 8. On November 6, Libya’s Supreme Court declared the House of Representatives which had set up the Libyan Parliament and all the other decisions it had taken null. “We are building a nation and it will be unprecedented if Malta expects us to be an anarchy... We respect the rule of law and once there has been a decision by the Supreme Court it has to be respected. "Respect for the rule of law is the only way that we can build a democracy,” Mr Musrati said. He said the Salvation Government was shocked by the Maltese government’s recognition of Al-Habib Al-Amin as the official representative of Libyan government in Malta. Mr Al-Amin was the Culture Minister appointed by the House of Representatives which the court had now declared null and when he came to Malta a few days ago, he took over the Libyan embassy’s bank accounts and stole the embassy cars, Mr Musrati said, adding that a police report had been filed. 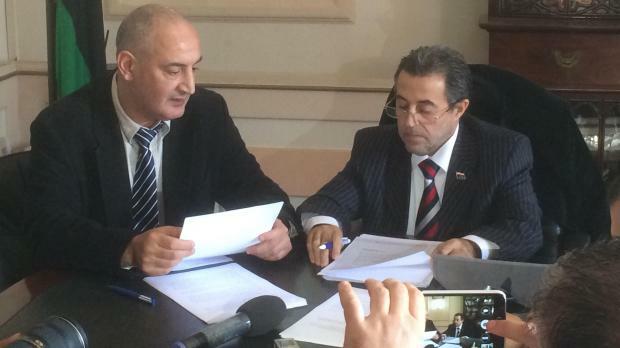 Accusing the Maltese government of taking sides, Mr Musrati said he had been requesting a meeting with Foreign Affairs Minister George Vella since his arrival in Malta but had not yet received any replies. The Salvation Government is still not internationally recognised as Libya's legitimate government but Mr Musrati said it was currently in contact with other European and African states and it would soon be recognised as the legitimate government of the Libyan people. The Salvation Government was currently in control of the area from Sidra Port on the east to the border of Tunisia and from the coastline in Tripoli all the way to the south. It was also in control of airport and military bases, he said. The Central Bank in Libya was also is working with the Salvation Government, which is receiving its finances and instructions directly from Tripoli. Malta, he insisted, should remain neutral in this conflict. In a statement, Mr Al-Amin said Mr Misurati was occupying the embassy illegally as it was himself who was the legal representative of the legitimate government. In another statement, the government said it never interfered and had no intention of interfering in Libya’s internal affairs. It said that its actions were based on United Nations and European Union guidelines. For the past weeks and months, it said, it had been taking part in serious attempts to strengthen dialogue in Libya aimed at leading to a transitional government, which, it hoped, would lead to peace based on the Constitution that was being drawn up. The government said it remained committed to see a united Libyan people enjoying peace and serenity. It said it always considered Libyans as one people and it was sad to see such division among the citizens of its neighbour state.